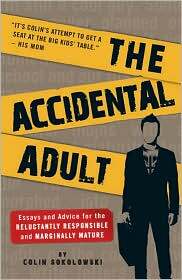 Colin Sokolowski author of The Accidental Adult should teach a course in how to deal with surly book bloggers. Seriously. The email he sent to me about his book should be forwarded from author to author and publicist to publicist as the textbook way to get your book noticed. It was short (nice), funny (super nice), and it showed that he has actually visited our site and read it (he called MN Reads witty and smart-assed, perfect, huh?). This is exactly why the The Accidental Adult zoomed up my To Read list, leapfrogging over books that have been on the list for much longer. So what would you like to know about Colin? How about this, on his bio page he writes that his proudest literary accomplishment was when a major market newspaper chose his letter to the editor defending Van Halen's Rock and Roll Hall of Fame induction as its “Letter of the Day.” Nice, it’s the perfect lead in to his six answers. I'm loving Steve Almond's essay collection Rock and Roll Will Save Your Life. He's got a very conversational voice, and he's super funny in describing the delusional power of songs. Next up will be Rob Sheffield's Talking to Girls about Duran Duran. Do you sense a theme here? I have a big-time crush on The Day I Shot Cupid's Jennifer Love Hewitt. She's fictional, right? I'm a big fan of Tom Perrotta. Before my book came out, I contacted him to see if he would blurb it for the back cover. He actually responded to my e-mail, and was quite kind and classy in essentially telling me no. His books Election and Little Children are probably his best known, but my favorite is Joe College. His protagonist is a working class college junior at Yale who doesn't realize he's an accidental adult in training. It's loaded with 1980s pop culture references and great descriptions of college life. Ah, the good old days. So I suppose I'd like to sink a few pints with Tom on the sidewalk patio at The Local. And try him again on that blurb request. Either Lord of the Flies or Of Mice and Men. I seem to recall they were among the first books I actually didn't fake book reports on for my ninth-grade English class (unlike Wuthering Heights). I know I should say The Bible, but I also think our souls really crave ? and deserve ? laughter. Very few books make me laugh out loud, but at least a dozen essays in The Phat Phree's Look at My Striped Shirt! had me laughing hard enough that my eyes produced tears. That kind of humor is worth preserving. I tried to read James Joyce's A Portrait of the Artist as a Young Man not once, but twice. Each time I just couldn't get past the first 50 pages or so. Maybe the third time will be the charm. If not, I'll wait for the movie.